Join the discussion on our forums! Come discuss Vendetta over in our dedicated Vendetta discussion topic. In view, a humble vaudevillian rogue spell cast vicariously as both Wing Blast and Scorch by the vile vicissitudes of lazy Blizzur card design. Before you play this, you have to stole Scorch and Wing Blast. Just for sure. I love this card. Burglar Rogue is a way to go this expansion. 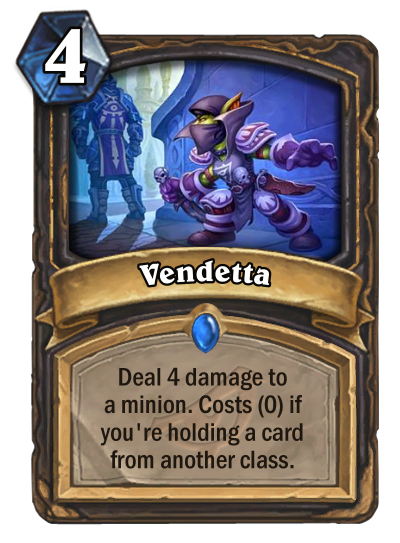 Evryone use Cheap Shot so Vendetta is insane ! No it's just ok, what we need ? is 2 mana Blade Flurry that don't give damage to face and canno't be using in wild. Just want to add, comment above sounds arrogant it's truth...everything that i've had is experience and love to Rogue. I always talked about the future with the gracefulness for this class, now i'm talking not about how good this cards for specific archetype, it's was a dialogue how good this cards for the class in the future and versatile classes. A better Backstab if the conditions are met. But with Hallucination rotating this will struggle to see play without other class-stealing cards.